Riding a bike is always a somewhat scary concept in an urban environment. Will car drivers see you? Will they understand your hand signals and give you room to turn? Or will they crowd you on the road and ignore your signs? 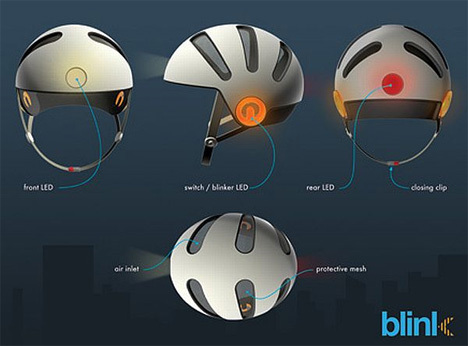 The Blink Bike Helmet aims to help cyclists stay a bit safer by taking all of the guesswork out of biking. 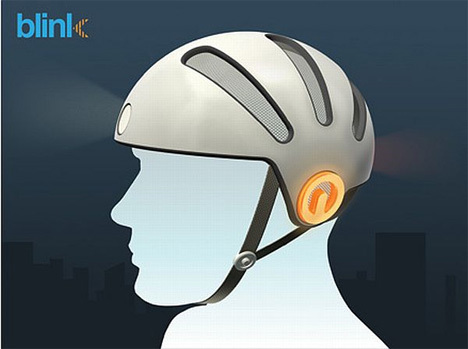 The helmet features blinkers that operate just like car blinkers, making a cyclist’s signals nearly unmistakable. To turn left, you tap near your left ear. To turn right, you tap near your right ear. And to turn the signal off, merely tap again. There are additional LEDs on the helmet to increase the rider’s visibility, making it unnecessary to carry additional lights or reflectors. 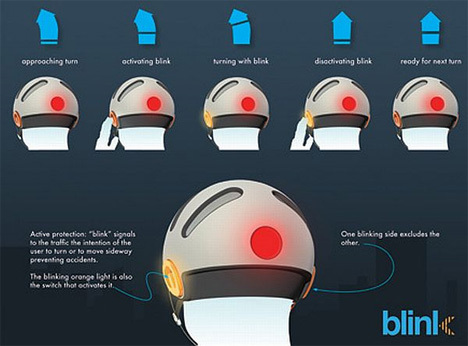 The Blink design was a prize winning concept in the 2010 Seoul Cycle Design Competition. The brilliant idea is the work of Italian designer Giovanni Doci. It is a simple, common-sense solution to a problem that every cyclist has faced at one time or another. See more in Home & Personal or under Gadgets. April, 2011.